After an accident, motorcycle rider of more than 20 years creates a new way for motorcyclists to be seen by other drivers and reduce collisions, and help bikers avoid distracted driving with a special, handsfree Bluetooth navigation app. SignalWear, the world’s first smart gloves to help motorcyclists signal lane changes and turns more visually to other drivers, launched April 3rd 2017, on Kickstarter. De Baca emphasizes that the reason SignalWear is a Smart Glove is because the gloves already contain built-in technology that can be unlocked. Riders have the option to upgrade and use the SignalWear GPS App to help them navigate when they travel without looking away from the road, reducing distractions and affording motorcyclists an extra degree of safety. De Baca says that as SignalWear gains more interest and support through the Kickstarter campaign, more smart features will be activated on the gloves. The Lane Changer – Smart gloves with super-bright chevron LED's that activate with a multi-function push I/O button. The Lane Changer can be pushed to manually activate an LED blinker with a micro switch in the thumb of the glove or by tilt activation. This is one of the many smart features that allow a rider to activate the LED’s by using the recommended two wheel safety hand signals for right and left turns. 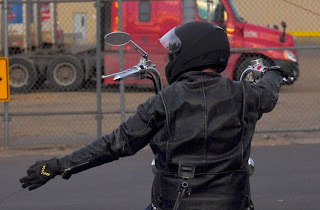 SignalBox - Another glove-activation mode that is hardwired into the motorcycle's existing blinker system, signaling the glove to blink in conjunction with the turn signal. With enough funding, SignalWear will introduce The Navigators - Heads Up, Hands Free GPS Navigation: SignalWear Gloves coupled with the functionality of "The Lane Changer" will alert the rider of upcoming turns and lane changes through vibration. This technology links via Bluetooth to a navigational phone app, which vibrates via haptic motors. To purchase SignalWear at an early-bird discount during crowdfunding, or for more information, visit the SignalWear Kickstarter Campaign Page. 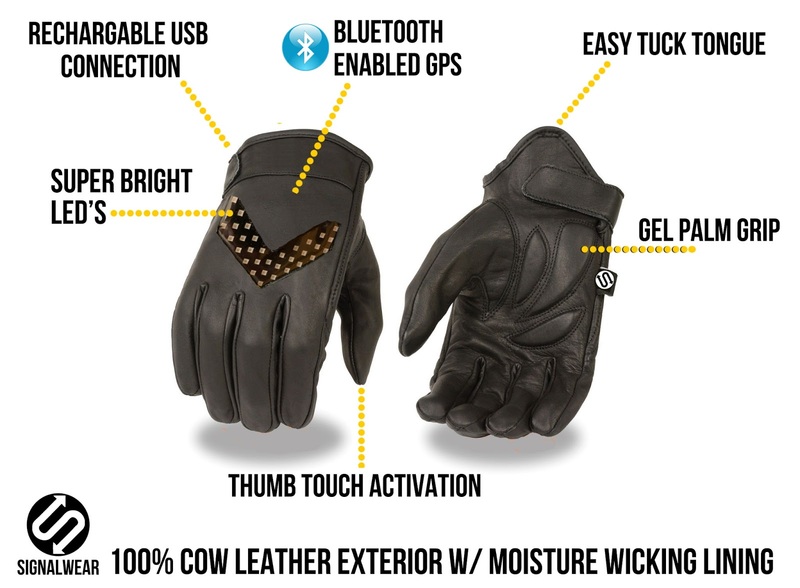 SignalWear is a wearable technology company, launching the World’s First Smart Motorcycle Gloves. Smart Signal Blinking Gloves allow motorcyclists to alert other motorists when they’re changing lanes and turning which is when most accidents take place. 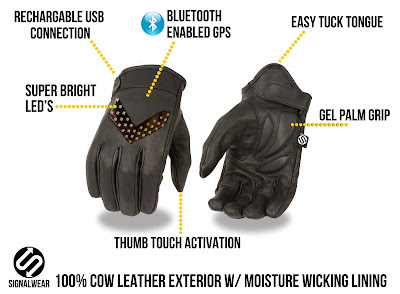 The gloves can also link to the SignalWear GPS App to help navigate without looking away from the road. An entrepreneur in a diverse range of industries who cut his teeth in website development and IT, Troy De Baca co-founded SignalWear with Dario Tucciarrelli, who works in the field of research and development. For more information, visit http://www.signalwear.co/.